Use heat to seal the deal. This straightforward heat food sealer creates an airtight, water-resistant environment for your food in seconds. This means no clamps, clips and rubber bands . . . and, better yet, no AAA batteries since Air Lock is rechargeable via USB. Seal up to 500 bags per charge, then slip it in a drawer or hang it on the fridge with the integrated magnet. You’ll throw away less food, save more money, and create less waste. Dimensions: 1" x 1" x 4"
I eat less chips if I reseal the bag between snacks. Genius! I live in a tropical area and no matter how much I do to minimize the attack from bugs (spraying) the ants always get into the dry good products (crackers, chips etc.). This tool allows me to seal the package opening after each use and while the ant problem remains they no longer gain access to my dry good supplies. Keep your food fresher longer with this food vacuum sealer and heat sealer. 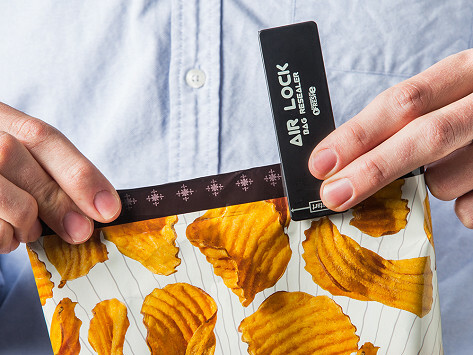 Air Lock gadgets help you preserve your favorite snacks and meals, easily. To close up bags with an airtight, water-resistant seal (think: chips, crackers, cereal, and baking goods), use their heat sealer. It’s rechargeable via USB (hooray for no AAA batteries) and will seal up to 500 bags on a single charge. The folks from Air Lock even thought to put a magnet on the sealer, so you can keep this handy food freshness device on your fridge door. 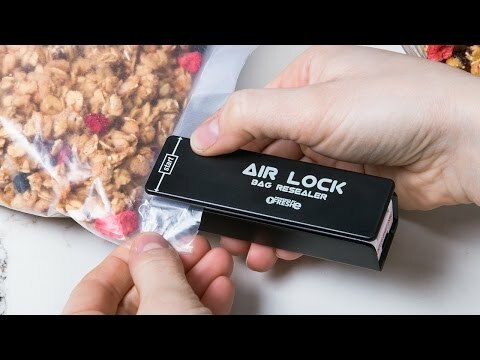 Or, to take all the air out of a bag, use the Air Lock vacuum sealer. It will create a vacuum seal in just 30 seconds. This sealer comes with freezable, leak-proof bags that make food last three times longer, marinate meat in minutes, and won’t get freezer burn. Besides keeping things fresher, you’ll save some money and waste less food, too. Go ahead and cook in bulk. You can seal in freshness in seconds.